What could be better than getting paid for something you want to do? Like riding roller coasters? Good. Then it’s like being paid to go to Disney World to ride Big Thunder Mountain. Love skydiving? Great. It’s like someone paying you to jump out of an airplane. So, how does this relate to the stock market? Well, do you have an interest in buying stocks $25 cheaper, $50 cheaper, even $100 cheaper than where they currently trade? Then someone will pay you cash upfront to do it. Then you haven’t been reading my articles in The Rich Investor. Tsk, tsk. I’ve shown on multiple occasions that selling put options is your key to not only getting paid cold hard cash, but it allows you to potentially buy any stock you want for any price you want. Let’s say your goal is to get exposure to the whole market. Buying shares of the S&P 500 via the SPDR exchange-traded-fund (SPY) is a great way to do it. But you really want to buy it at a bargain – not at its current price of $259. Looking at the weekly chart below, you decide that $160 per share is your ideal price. That would be a five-year low. Since its current price is $259, obviously no one is going to sell it to you now at $160. But that’s not a problem, nor a hindrance to getting immediate payment. 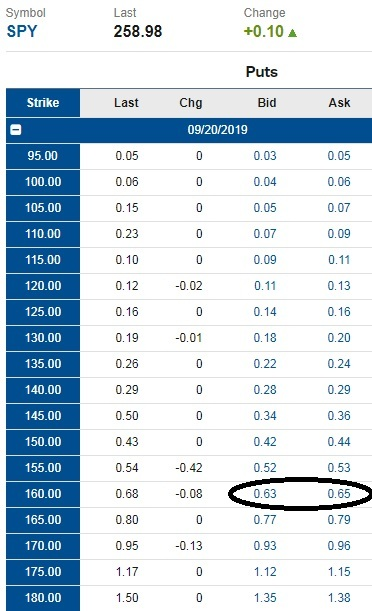 Above is a sampling of put-option prices for SPY that expire in September 2019. I’ve circled the $160 strike row that shows a current value of $0.63 bid/$0.65 ask, with a fair middle value of $0.64 per contract. The “strike” describes the level at which you could potentially buy shares of SPY in the future. By selling one $160 strike put option, you are agreeing to buy 100 shares of SPY at $160 per, between now and September. In exchange for your agreement, someone will pay you $64 today. In essence, you’ve contracted yourself out to buy SPY at a price of your choosing in exchange for an upfront payment. 1. If SPY closes below $160 at the September expiration day, then mission accomplished. You will follow through on your agreement and buy the 100 shares. This will require full payment of $16,000. Plus, you keep the $64. The only way you would be able to buy the shares at your desired price of $160 is if SPY actually falls to that level by September. 2. If SPY closes above $160 (the more likely outcome) at expiration, your contract will expire, and no shares will change hands. You keep the $64. At this point, you can repeat the process by selling a new put option (establishing a new buy level) and receiving a fresh influx of upfront cash to your account. You might be thinking – who pays me this money? It’s from other speculators in the market, specifically, the buyers of those put-option contracts. When someone buys a put-option contract, they’re expecting the price of the stock to fall. In the example above, they’re banking on SPY moving lower. If that happens, the value of the put option will go up in price, allowing the buyer to sell it for a profit. Options can be traded just like stocks. If they move in the right direction, they can be offset, which locks in the gains. But if the stock moves in the wrong direction (higher), the put option will lose value, giving the put-option buyer a loss. In the case of a put-option seller, it doesn’t matter if the stock goes up or down. You will get paid an upfront premium regardless. If the stock moves lower, then the chances of you having to follow through on your agreement go up. This is a good thing though, as you will be able to fulfill your wish to buy your chosen stock at your chosen price. All the put-option seller needs to do is sit and wait to see where the stock ends up at expiration. There’s another way to look at this kind of trade though, if you’re the put-seller. Just like an option buyer who can offset a trade by selling it for a higher price, the option seller can do the same, just in reverse. A put-seller can buy the option back at a cheaper price than what it was originally sold for. For instance, let’s say we sold the SPY option for $0.64 per contract. 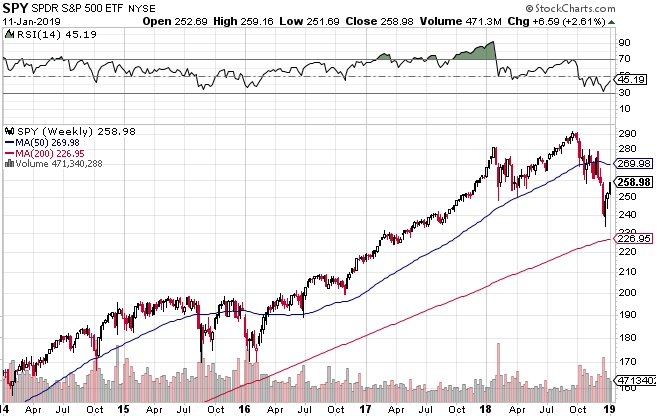 A few months later, the SPY rallies, putting downward pressure on the put-option price, placing it near $0.12 per contract. We could purchase the option back at $0.12 and lock in a $0.52 per contract gain. That represents an 80% decline in the value of the option since it was first entered. I call this my “80% Rule,” and in my newsletter advisory – Instant Income Alert – we always take profits and lock in gains when we reach the 80% threshold. When doing this, it offsets the initial trade and the contract ceases to exist. We no longer are bound to the agreement to buy the shares of SPY at $160 per. But this is fine for us as we’re making good money along the way by collecting all the locked in income. In fact, in our first year of inception (since May 2018 actually), we’ve locked in gains on 100% of our closed positions by closing the trades in the manner discussed above. We plan to have similar results in 2019 by selling more put options. In the end, we’ll either get to buy quality stocks at rock-bottom prices or we won’t. Either way, we still get paid. It’s a win-win! That’s all for today. But come back on Thursday when I’ll discuss how to sell put options on Warren Buffett. You won’t want to miss it!